As marketers, we find ourselves in a digital marketing melting pot, where brands and customers are thrown together towards one common goal: remaining relevant. 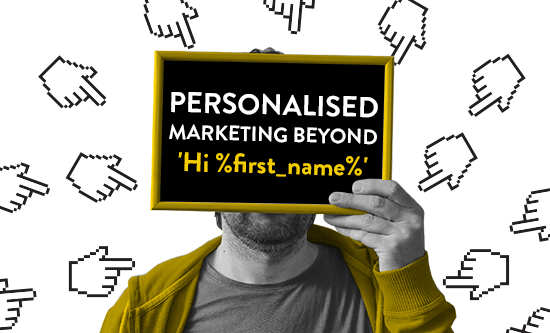 Now more than ever personalised marketing becomes a hot topic for digitally driven companies worldwide. As the customer’s standards for interaction grow and change, we find ourselves in the precarious position of becoming the customer in order to show them we know what their needs are, and are able to meet them. One-to-one marketing improves the brand-customer relationship by creating relevant interaction; we know which customers would benefit from our products the most, and the deals they would most positively respond to. Let’s face it, no one opens those cookie-cutter automated emails that clutter up the inbox. We all send the Dear (Insert Name Here) emails straight to the trash. Why? Because they are from noone, to noone. By showing that we have an interest in our customers, we stand out as the more likeable choice. Now, with highly-integrated automated personalisation, we can track our customers’ behaviour and adjust our marketing to their needs. It is dynamic personalisation at scale, using an AI-powered decisioning engine to give the customer exactly what they want: our undivided attention. No one wants to feel like a random name plucked from a list. Really, what it all boils down to is this: strengthening customer loyalty. Let’s paint a picture. Jane is in the habit of buying vanilla scented candles. Data tracks her interest, and we use this to suggest she should take a look at our 15% off deal on therapeutic incense. By using insights to determine her interest, we have managed to suggest a relevant product. With automated marketing at scale, we can do this for more than Jane; we can do this for Jack, Jessica, John, and all our other customers. With actionable insights and billions of customer data points, we are able to determine which customers to seek out, and what it is we should talk to them about. It drives revenue, improves customer experience, and helps us optimise our customer relations. It is a genius method in symbiosis, with customer data and company interest working to the benefit of all involved. It’s happening everywhere; brands are finding a meaningful way to connect with their customers, and it’s working. No longer is personalisation a choice, it’s a necessity. AI-powered decisioning gives us the opportunity to engage with our customers at scale through the channels they prefer all while being relevant. Being a customer has never been so easy, and staying with the times when it comes to digital marketing has never been so vital.